If you are here and reading, chances are you love mason jars. ME TOO. 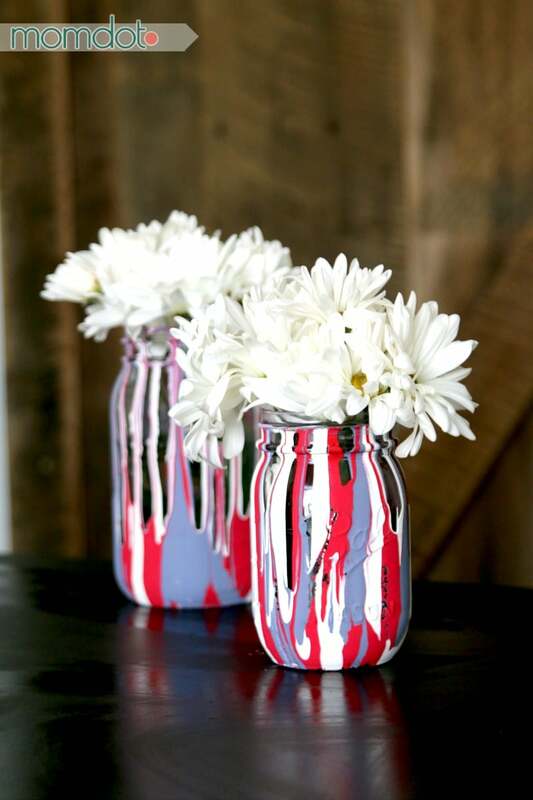 Before we get launched into the drip painting mason jars DIY below, I want to make sure you don’t miss any of the past super fun mason jar crafts I have on MomDot. Whew! That’s a lot of jar crafts! 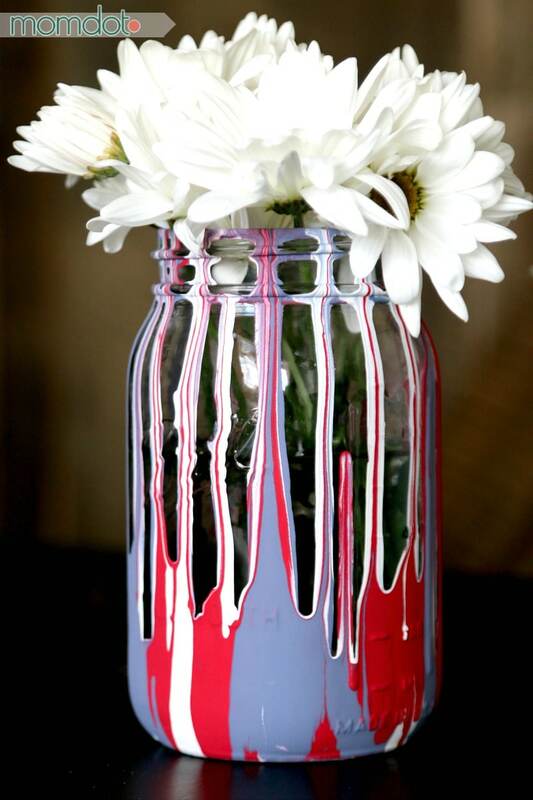 And here is another one to add to the collection: Drip Painting Mason Jars. VIDEO ON HOW TO DRIP MASON JARS- Watch it done below! Now I tried a few types of paint with this and in the end, my very favorite paint that had the right amount of flow to create patterns and coverage was this milk paint . I have been really itching to try to use milk paint as I have heard so much about it, so I am pretty pleased it was great for this project. I picked these colors up for about $6.99 at the craft store, and they come with enough paint for many projects. Originally I had painted the jars straight out with the milk paint and it was pretty thin coverage. That means to me if you want to have a fully coated jar by paint brush, you are likely going to have to have more than one coat after drying. 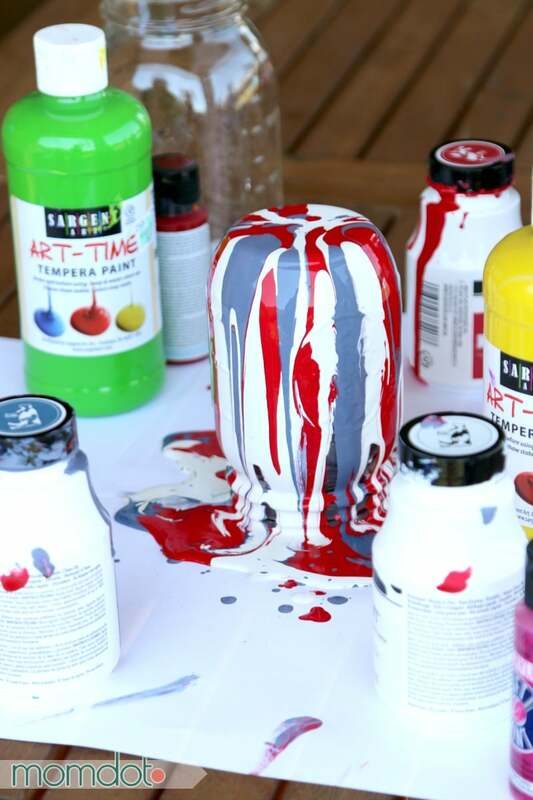 In this particular case of drip painting, it’s as simple as pour and wait to dry. mason jars – note that while so many love Ball Mason Jars , after doing this project I would prefer to find mason jars with no decor on them. You can typically pick them up at a Dollar Tree I have been told. I think when you do paint on the outside it can chip too easily with the extra designs. If you do prefer to use Ball Mason jars or mason jars with extras on them, you may want to see your paint from chipping. Put your mason jars upside down on a few pieces of newspaper or printer paper to catch the mess. Simply pour slowly around the bottom of the jar so it flows down. My best tip is to pick a corner and pour just a little bit down in different patterns, alternating colors and areas on the jar to get a nice look. I originally thought it would be fun to start in the middle of an upside down jar and pour, then pour the other color on it, etc. But basically, when you do that each color covers up the other one so…skip that. Note that drying time takes about 24-48 hours depending on how thick your paint is. They were actually dry to the touch about 5-6 hours in but you still need time to be ALL THE WAY dry. If you have a lot of paint on the very bottom, you may need to wipe it off (that’s a choice). The bottoms of mine took a long time to dry so about half way in I realized I should wipe some paint off. Who is gonna see the bottom anyway, you know? I love how they turned out! I did mine in Red, White, and Blue so I can fill them up for July 4th! Make sure you are following me on Pinterest for more awesome crafts. Have you created any of my stuff? Give me a shoutout at any time by using #momdot on your favorite social media channel.